The project has obtained an official permission to employ the ICNP terminology in the learning materials, which will facilitate terminological unity and contribute to creating highly-relevant learning content. An announcement about cooperation together with project website link with the project was made on the ICNP website (http://www.icn.ch/details/2/994.html). The International Council of Nurses (ICN) is a federation that unites 130 national nurses associations which makes more than 16 million nurses worldwide. It was founded in 1899 and nowadays is recognized as the world’s first and widest reaching international organisation for healthcare professionals. ICN works on both international and national levels with the aim to ensure good quality of nursing care, work on health policies and the advancement of nursing knowledge. It also aims to demonstrate nursing worldwide as a respected and competent profession. With passing time ICN established a number of networks and connections to professionals from the field from national, regional and international nursing and non-nursing organisations. The federation cooperates with e.g. the World Health Organization, the International Labour Organisation, the World Bank and a range of international non-governmental organisations. The International Classification for Nursing Practice (ICNP) has been created by the International Council of Nurses (ICN) as an international standard of formal terminology used in nursing practice. The product, with its first edition in 1993, provides a dictionary of terms and expressive relationships that nurses can use to describe and report their practice in a systematic way. The idea of international classification of nursing practice emerged in 1989 when some nursing professionals decided on the need to classify and group specialist terminology that is used to describe nursing interventions and actions on the basis of nursing interview. ICNP® is intended for use by and for nurses. It is a rich and comprehensive resource that nurses can use to describe and report in detail the things that they assess and the things that they provide. ICNP® database is used to support care and effective decision-making, promote high level of nursing education, research and works on health policy. The first written version of ICNP® appeared in 2005. 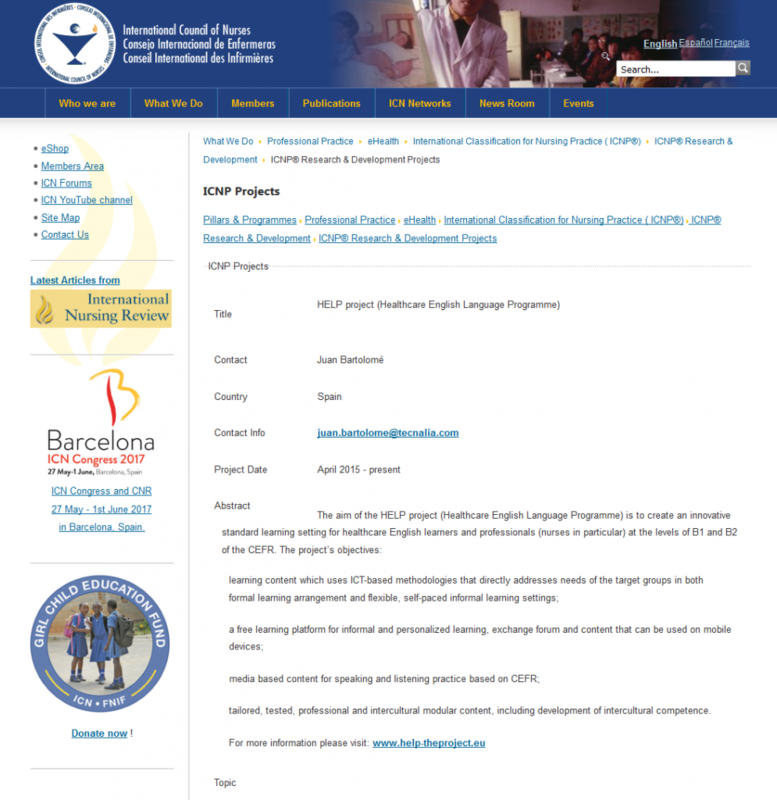 The main version is created in English; yet there are a few translations to other languages, aimed at the countries where the ICNP® standards have already been introduced (please check at: http://www.icn.ch/what-we-do/icnpr-translations/). ICN emphasizes that good-quality translations are indispensable for successful ICNP® implementation. It is also important to notice that there can be only one national version of ICNP® standards.